Photograph from the Elgin Collection: 'Autumn Tour 1895. 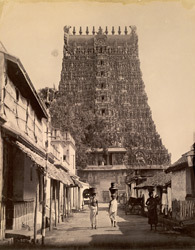 Vol II'of the southern gopura of the Minakshi Sundareshvara Temple at Madurai, taken by Nicholas and Company in the 1890s. The Minakshi Sundareshvara Temple was built under the patronage of Tirumala Nayak (1623-1659). The temple is dedicated to Shiva and his consort Minakshi. The complex is within a high-walled enclosure and has eleven huge towers and four entrance gopurams. Inside this enclosure there are columned mandapas, tanks, shrines and the two temples of Shiva and Minakshi. This view shows the south gopura, one of the four gateways to the temple, that reaches 60 metres. By Nayak times, these imposing gopura were a typical feature of south Indian temple architecture. They rise from a granite base in numerous diminishing storeys with curved profiles and end with a barrel-vaulted roof. They are completely covered with brightly coloured stucco sculpted figures of divinities, celestial guardians, musicians, monster masks and animals.